Yorkshire’s number one family pantomime, CINDERELLA, opened in December 2017 to packed houses and glowing reviews, and will run until Sunday 28 January at the Alhambra Theatre in Bradford. This year’s pantomime is led by Bradford pantomime king Billy Pearce, singer and Loose Women panellist Coleen Nolan and stage star Shane Nolan; and they are joined by an array of talented musical theatre performers: Yorkshire-man Jack Land Noble, Graham Hoadly, Sarah Goggin and Sam Barrett. In order to deliver this “magical, spectacular” show, which “is one of the best pantomimes around and a must see…” (Yorkshire Post), there is an army of backstage people, production crew and venue staff who work tirelessly during rehearsals and every performance to bring this magical show to life. The annual Alhambra Theatre pantomime brings together the work of over 40 technical and production staff, 20 performers and musicians; and 20 local children as The Sunbeams. Plus there are up to an additional 160 venue staff, including bars & catering, box office, cleaning, front of house and stage-door teams, who work to ensure the venue is ready to open its doors to the public during the run of pantomime. 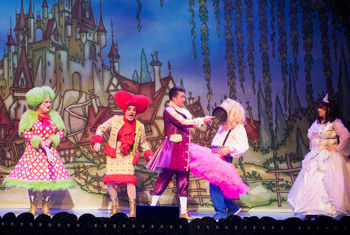 • 11,424 tubs of ice cream were ordered during panto. Had they been stacked one on top of each other, the tower would have been over 750 metres high - that’s over 2.5 Eiffel Towers and would have made it the second largest tower in the world! • Most of the backstage crew know the dance moves to the routines and you can find them dancing along in the wings! • There were 2 “vet” visits a week for the flying horses; and 2 bags of horse nuts used a week! As well as the all-star cast, ground-breaking special effects and specialist costumes once again took centre stage. Over the past six years, audiences coming to the Alhambra Theatre pantomime have been treated to an array of show-stopping effects, created by The Twins FX. In addition to The Twins’ effects, this year the Alhambra Theatre pantomime also boasted input by Mike Coltman and his team at Costume Construction, who are providing an array of specialty costumes and props for the show. Unmissable 3D spectacle also returned to this year’s Alhambra Theatre pantomime in the form of an eye-popping journey through the Enchanted Forest! It was at the Alhambra Theatre ten years ago that pantomime producers, Qdos Entertainment, first featured ground-breaking 3D as part of their shows.